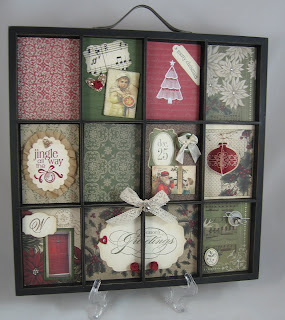 If you look back, I posted an altered photo tray earlier this month (Nov. 13th post). Well, I have been wanting to alter one these,too. I used SU! products to make this adorable little thing. Each 'well' measures (roughly) 2 3/4" x 3 3/4". So everything is roughly the size of an ATC, a playing card, or a wallet photo. I have left some spaces blank just for photos. The potential for these trays are endless. You could make tags to fit into each 'well', you could hold a collect of ATC's, you could put a school photo to represent each year of school, you could put a photo of the front door of each of your past houses, your grandparents houses, a photos of your favorite vacation spots, photos of the national monuments, etc. See, the possibilities are endless! You could even combine 'wells' to create a larger space. As I have done at the bottom, to hold the 'Seasons Greetings' stamp. I just love the font! I used the current SU! holiday paper, 'Deck the Halls' (#120810). Some of the papers are just so gorgeous that you don't want to cover them, so I just added some rhinestones or tiny embellishments. (the upper right and bottom right). I shop in Albuquerque, New Mexico, and they don't have a local store that sells these trays, so I have to order them off the Internet. They are a bit pricey, @ $19.95 each, plus s&h. But, if you ever get a chance to pick one up, or you need to add one more item to your virtual cart to obtain 'free shipping' I would strongly recommend one, or even two. They are so much fun, that I don't think I could stop at just one. Thank you for looking! Enjoy what's left of your weekend, I am off to pick up my oldest granddaughter. She is crafty and loves to bake, too. So we are going to make our own home-made marshellow today! How fun is that? It's absolutely beautiful! I like that you used the same GF snow girl image as I did for ornaments.